WEAVERVILLE, NC – A new 117,000-square-foot Lowe’s Home Improvement store will open to the public at 7 a.m. on Friday, May 22. Employees are stocking more than 40,000 items right now, according to a company press release. Typically, a store this size represents an $18.5-million investment and creates up to 175 jobs. Wal-Mart is scheduled to open a new Supercenter near the Lowe’s on June 17. The two retailers are in the Northridge Commons development, which is just off Future Interstate 26 at the Weaverville exit. Initially, developers planned to also build a 30,000-square-foot retail strip to house smaller shops, but those plans are on hold because of the recession. Lowe’s of Weaverville, as the company refers to the store, will hold a formal grand opening ceremony at 10 a.m. on Thursday, May 28. Lowe’s will offer a "Card Match Day – Buy a Gift Card, Help Build a Home." Shoppers can buy a Lowe’s Gift Card and Lowe’s will match purchases up to $5,000 to support Asheville Area Habitat for Humanity’s next building project. The store is located at 24 Northridge Commons Parkway. Lowe’s has more than 1,650 stores in the United States and Canada, but it has slowed its expansion pace this year. 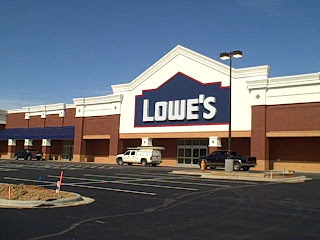 In the 2008 fiscal year, which for Lowe’s ended in January, the chain planned to open 120 stores. Plans for 2009 call for 75-85 new stores. "Lowe’s has slowed the pace of new store development, but we’re still dedicated to the long term," spokeswoman Karen Cobb said in December, adding that the company does extensive market research before opening a new location and remains enthusiastic about the Weaverville market. "When we make a decision to open a new store, it’s because there are homeowners to serve, and we feel like there’s plenty of growth potential in the community." Based in Mooresville, Lowe’s had fiscal year 2008 sales of $48.2 billion. It serves approximately 14 million customers a week. Founded in 1946, Lowe’s is the second-largest home improvement retailer in the world. For more information, visit www.Lowes.com. You are currently browsing the archives for the Lowe’s category.